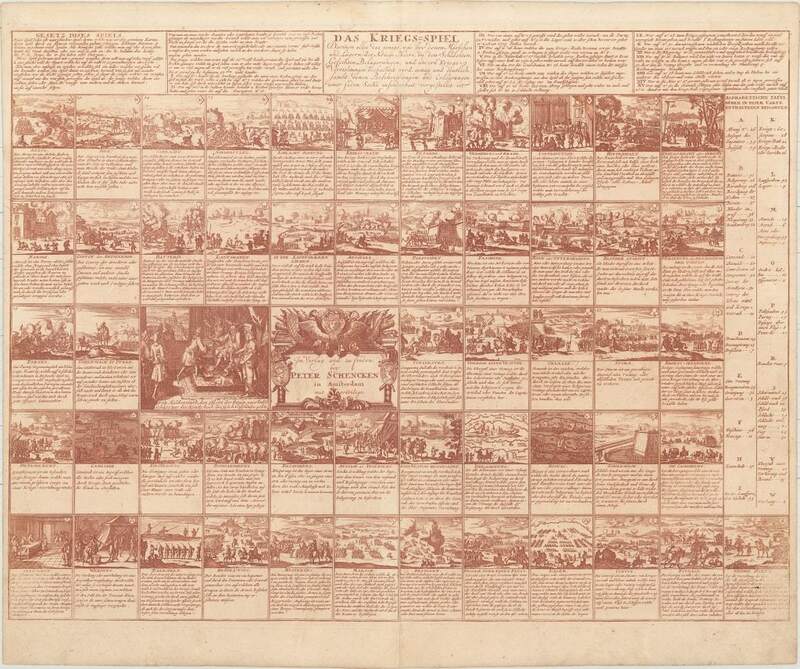 Engraving in sepia ink on laid paper depicting 52 playing cards, each 3 ¼”h x 2”w, plus title and instructions, the whole 18 ¼”h x 22”w at neat line plus margins. 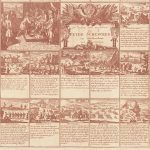 Published around 1700, this Kriegs Spiel, or “The War Game,” is a scarce and attractive sheet of playing cards designed to educate young people in the elements of conducting a military campaign. 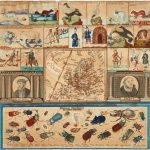 The sheet comprises 53 engraved panels numbered sequentially. All but one is a playing card using the French suits, each bearing an illustration of a military maneuver or fortification element along with a brief explanatory text. Along the top of the sheet additional panels list the game’s rules, and a panel along the right edge contain an index of important terms. A central panel bear the Schenck imprint against an architectural backdrop adorned with military hardware. The sheet could be dissected for use as a traditional deck of cards or left intact for use as a board game, using the rules printed at the top. These appear to be fairly straightforward, involving the rolling of dice to determine one’s moves, the victor being the first to land on panel number 53. Additional rules add spice to the game; for example, anyone landing on panel number 7 (the “defile”) must contribute a penny to a pot before being permitted to exit. By progressing through all the panels, players are exposed in sequence to the various elements of a typical military campaign, from enlistment and training through the final assault and conquest of a fortified town. The final panel “53” bears a vignette of a monarch rewarding a victorious general with a marshal’s baton. 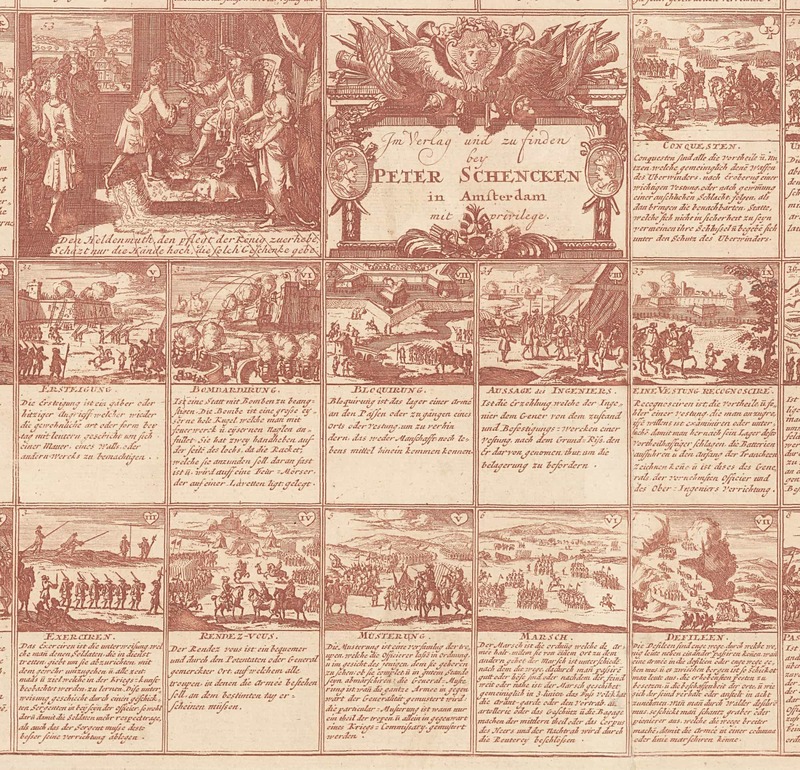 According to the British Museum, Amsterdam engraver Peter Schenck based Das Kriegs Spiel on a French edition designed by Gilles de la Boissiere, published by J. Mariette in 1692, and bearing the title Jeu de la Guerre. 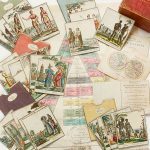 Boissiere and Schenck each also issued versions of a “Fortification Game” (Jeu des Fortifications / Festung Baues Spiel), which employs a very similar graphic design and set of rules. Games with a military-educational theme are rare, especially from this early date and in complete condition. 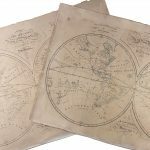 Featuring Schenck’s refined engraving and printed in sepia, this example is most attractive. British Museum #1896,0501.1337 (printed in black). Beinecke Library-Cary Playing Card Collection #780. Minor soiling with a weak impression in bottom right corner and professional repairs to a centerfold separation at bottom and to two 2" clean cuts adjacent to the centerfold at top.